During the first half of February, the weather was like spring and most of the snow around our buildings melted. Then in the middle of the month we got several snowfalls that blanketed the Abbey. The trees in the forest were singing-the more snow the better to prevent forest fires in the summer. Nevertheless, the signs of spring are coming with days getting longer now. 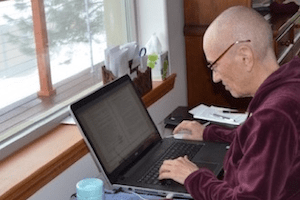 A lot happened at the Abbey in February and so there are many links to essays, Bodhisattva’s Breakfast Corner talks, and photos for you to enjoy. After the Living Vinaya in the West program concluded, we began winter retreat-this year focusing on the practice of Amitabha. We’ll tell you more about the retreat next month, but in the meantime if you’d like to listen to teachings on the practice, see our YouTube channel. Also, first week photos are here. Wishing a very happy Chinese New Year and Tibetan Losar to our friends in Asia! Photos of our New Year Tara Puja are here. We wish you all Dharma joy and happiness. I have moved into the now completed Prajna Cottage and am very happy there, enjoying small pleasures such as a flush toilet and hot shower, as well as the happiness of the Dharma. Many thanks to all of you who contributed in so many ways to the construction of the cottage, which will benefit abbesses and abbots of the Abbey for many generations to come. Ven. 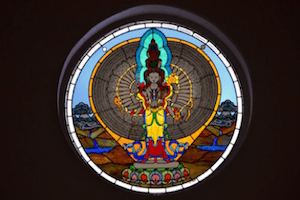 Samten made her last video about Prajna Cottage. It’s terrific; watch it here. 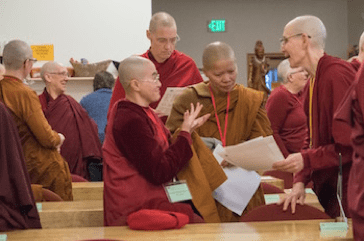 An important moment for American Buddhism took place at Sravasti Abbey from January 22 to February 8, 2018, when 49 nuns gathered for “Living Vinaya in the West.” Venerable Bhikshuni Master Wuyin and six nuns from her Luminary International Buddhist Society were the instructors. 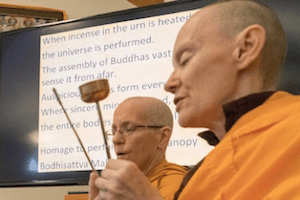 The 17-day course was an experience in learning and living the Vinaya-the monastic ethical code that includes advice the Buddha gave 2,500 years ago to guide, govern, and support harmonious monastic communities. Read our full report here. In addition to a full teaching schedule, Ven. Master Wuyin addressed a group of volunteers while she was here, speaking about the important role of lay practitioners in spreading the Dharma and supporting the sangha. Listen to the talk in Chinese with an excellent English translation. She also gave a talk especially for the Abbey’s extended community about her experience at the Abbey and her hopes for the future. Watch the video in Chinese with English subtitles. Harsha from Global Buddhist Door interviewed Ven. Chodron about Living Vinaya in the West. Read the interview here. 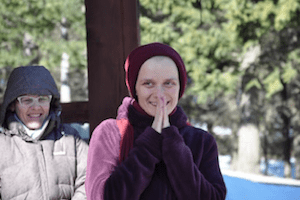 There were many blessings during the Living Vinaya in the West program. The teachings, of course, are a huge blessing and inspiration. Another one occurred at the beginning and end of the program. Read about it here. 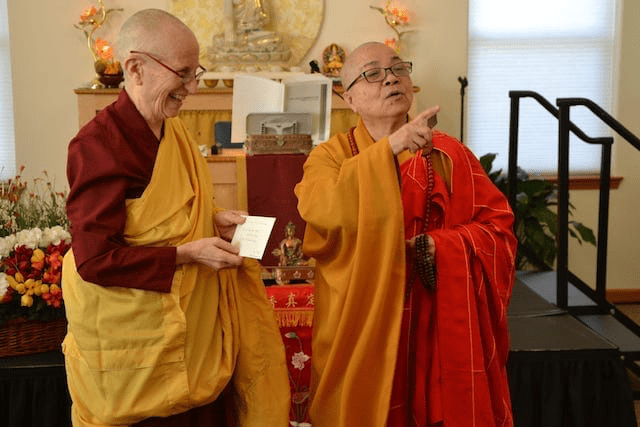 Bhiksuni Changshen, a nun from Dharma Drum Mountain, thanked Ven. 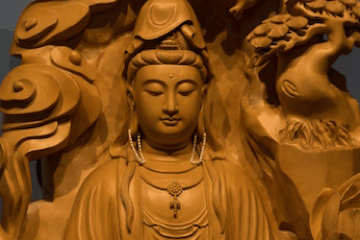 Wu Yin in a moving piece about the pioneers who bring the bhiksuni ordination from one land to another. Read it here. Christina, an anagarika at the Abbey, was energized by the program. She tells us about her experience here. Look here for photos of Living Vinaya in the West taken by Gen Heywood, a professional photographer. Vinaya course photos courtesy of Gen Heywood Photography and Luminary International Buddhist Society. 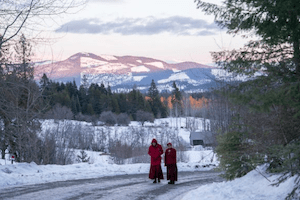 On February 4, Rebecca Bradley, an anagarika at the Abbey, became Venerable Thubten Lamsel in the first sramaneri (novice) and siksamana (training) ordinations done in English and conducted entirely by Western bhiksunis. 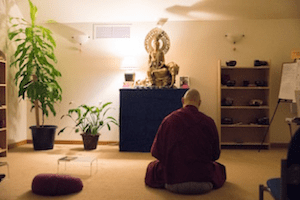 The ordination occurred during the Living Vinaya in the West program. Venerable Master Wu Yin insisted that the ordination be given solely by Western bhiksunis, although she and her students numbered among the 26 bhiksunis who witnessed the ceremony. Most Western bhiksunis had never been present at such an ordination before, and it was a moving and joyous occasion for everyone involved. Rejoice in the photos here. Poṣadha is the fortnightly purification and renewal of monastic precepts that the sangha does together. 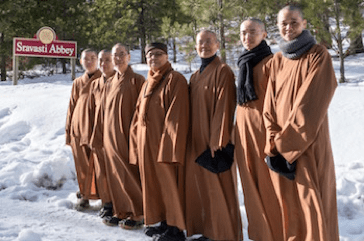 At Sravasti Abbey we do this regularly, but during the Living Vinaya in the West program, the ceremony was special because there were 26 bhiksunis present. The sound of our voices chanting in harmony represented the offering we made of our physical, verbal, and mental harmony. Ven. Samten attended a two-day intensive, interactive course known as ASIST, designed by LivingWorks, that helps people recognize, assess risk, and intervene to prevent the immediate risk of suicide. She reports, “I was motivated to learn more about how to be present and skillful when encountering someone expressing symptoms of depression and articulating thoughts of hopelessness, despair, and suicide. We are receiving more and more emails and phone calls at the Abbey from people who are struggling on all levels. Until taking this course I felt very ill-equipped about how to engage in a skillful, helpful way. “It was fascinating to see the shift in my mind. Thinking about the topic of suicide for two days, discussing and practicing ways of intervening, and cultivating a deeper understanding of the causes and conditions that may lead a person to consider ending their life took the edge of uncertainty away for me. Together with other spiritual leaders, she presented the Buddhist perspective and responded to audience questions. A topic of particular interest was each tradition’s view of suicide. Interfaith understanding is crucial in healthcare settings, so that medical professionals understand and respect patients’ values and healthcare decisions. The panel helped students to learn more about faith-related issues and deepen their understanding of their own faith traditions. May they come to serve as leaders in educational and healthcare settings to encourage interfaith dialogue and understanding. Vens. Semkye, Chonyi, and Tsepal attended a Spokane area organizing meeting of the Poor People’s Campaign (PPC) begun by Dr. Martin Luther King in 1968. A year before his assassination, Dr. King launched this campaign to improve the basic human rights for all Americans. He envisioned a mass march on Washington of poor people from across the country to demand better education, better jobs, better homes-better lives than what most of them were living-but that dream was cut short. With over 45 million Americans [14.5%] living below the poverty line, Dr. William Barber has reignited Dr. King’s call for a mass Moral Revolution of Values across the US to end racism, poverty, and ecological devastation, all values that the Abbey supports. The Spokane meeting sought ideas, understanding of PPC goals, local and national timelines, and next steps for this multi-year undertaking. See the PPC website for more information about this spring’s public launch and 40 days of action. For Spokane-area info see Peace & Justice Action League’s Facebook Events. Like many others, we were deeply affected by the school shooting in Parkland, Florida, where 17 teenagers were murdered and many more traumatized. Ven. Chodron spoke about this on three occasions, emphasizing our responsibility to remain compassionate while advocating for change. Here’s the first talk on the Florida massacre, the second talk which mentions Grandmothers against Gun Violence, and the third talk on restoring hope by resetting our motivation. Having trained at the Abbey for six and a half years, Ven. 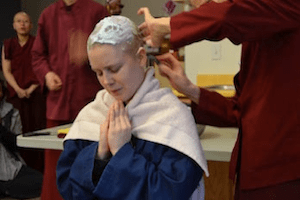 Jampa returned to her native Germany where she plans to get her PhD, help at the Tibetan Centre Hamburg (the Dharma center in Hamburg that has supported her for years), and participate in sangha activities with the nuns in Germany. It was a moving goodbye with everyone rejoicing at Ven. 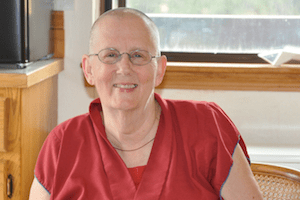 Jampa’s contributions to the Abbey and her progress in the Dharma. She will keep in touch with the Abbey as she goes forward, and Ven. Chodron will see her this spring when she teaches in Germany. Luis continues his series of reflections on love with “The Meaning of Heart.” Read it here. Watch this video on the development of Jangchub Choeling Nunnery in Mundgod India. Vens. Chodron and Damcho visit them when they go to India.